Design, build & launch your website in one weekend. Imagine being given the tools, confidence, and support you need to create a beautiful and professional website, in just 2 days.That’s what Launch is all about. Launch is a 2 day live workshop, hosted right here in Bloomington. It’s a local, high-energy event to make great web sites for people in our own backyard, at a price any organization can afford. Launch is about empowering you to take a hands-on approach to your website. As a leader or entrepreneur, you already know how important it is to have a professional web presence[simple_tooltip content=’In fact, one Stanford Lab study suggests that roughly half your audience will immediately discredit your entire organization if your web design is poor.’]1[/simple_tooltip]. We also recognize that you’re used to being in control of the process, and your time is valuable. We’ll teach you the skills you need to create a visually stunning, modern and mobile-friendly website that ranks well on search engines and plays nice with social media. Dates for our next Launch Bloomington Event will be announced soon! We’re working out the details for our next Launch Bloomington event. If you’d like to be added to the our Launch Updates list to be the first in line to register for our next event, simply give us your info below. Whether you’re tech-savvy or tech-terrified, we’ll create your site with you, giving you the confidence and training you’ll need to keep it updated into the future. Like us now on Facebook and get $25 off your Launch registration or any other future August Road service, plus other special offers & discounts. Throughout the workshop, you’ll be given step by step guidance to design a web site and get it live. Seasoned designers roam the room, available to give you one-on-one support as your site comes together, and a professional photographer will work with you to capture new photography for you to use on your design. At the end of the event, we launch each new web site, celebrating together as they come online. Our goal is to empower you to take charge of your website. We want you to see that you can do this. You don’t need to be a tech wizard or design guru to create a great site; you just need the right guidance and the right tools. At Launch, we’ll give you both. Then you can get back to all the other things that matter to you and your business. Need more info? Not sure what to think? We know this is might be a bit new and overwhelming. If you’re wondering if Launch is the right fit, we’d love to help talk it through with you. We’re not about pressure – if Launch is not the right solution, we’ll be the first to say so. So give us a call at (812) 671-0225 if you want to learn more, or fill out the form below and we’ll follow up with you. Launch is $1,499 (or only $1,099 with early bird registration) – that’s 75% less than the average cost of having a site professionally designed. Your only other expense will be a small monthly fee to “host” your site online, which also covers basic updates to your web site system. This cost is $30 / month. Register with a friend and you’ll each get $100 off the your registration, even at the early bird price! Discount will be taken off final payment (1 discount max per person, please!). Contact us to arrange your discount. Refer someone you know who needs a site to Launch and we’ll send you $100. Make sure they mention you when registering (not to be combined with the “bring a friend” discount). If you’d like more information about the Launch experience, check out the FAQ or feel free to get in touch – we’d love to talk with you and answer any questions you might have. You might also want to read what people who have come before you have thought about working with us! Launch happens every few months in downtown Bloomington. Dates for the next Launch Bloomington event will be announced soon. We’ll gather at the Ekah Yoga Studio and get to work. 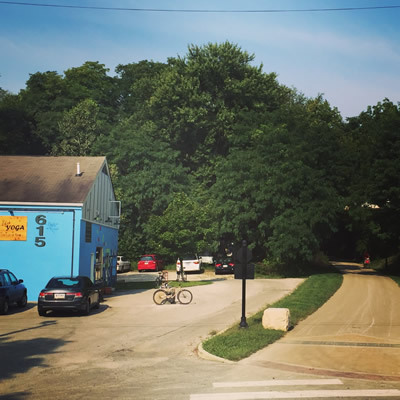 Ekah Yoga is located at 615 N. Fairview Street (click for a map), just west of Upland Brewery or north of 9th Street Park. If you prefer, take the B-Line to the studio and look for the blue building where the trail crosses Fairview Street. We’ll have hot coffee waiting for you when you arrive on Saturday morning. Be sure to bring your branding and content homework with you (you’ll get more info on this after registering), along with a laptop and clothes you’re ready to be photographed in. Find answers and learn more by reading the Launch frequently asked questions. You can also call us anytime at (812) 671-0225 or email us. Registration Available Soon – Enter your info below to be notified as soon as dates for the next Launch are announced! We’ll send you a free internet marketing training! “A Simple Plan to Market Your Business Online”. This video is jam-packed with helpful tips to market your organization online. We’ll even lay out a plan showing you how to create a year’s worth of internet marketing in one day, so you can get back to running your business.